3snaps - Mihal Freinquel: Would You Rather: Designer Schlep or Tacky Chic? Would You Rather: Designer Schlep or Tacky Chic? The look says, "I care, but not too much." Nothing is over-done. 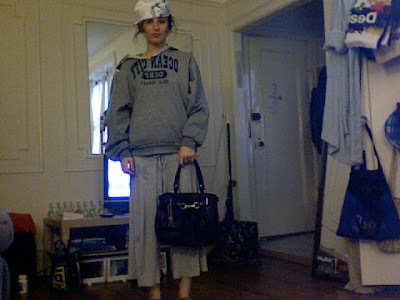 In fact, most of it is understated - with one or 2 designer duds to top it off (bag, sunglasses, jewelry, etc). It's casually fabulous...fabulously casual. Everything looked cheap and plastic and the ensemble wreaked of effort. To the untrained eye perhaps she looked dressed up - if I were a doorman at a nightclub I'd let her in no question - but to the eye that is drawn to expensive things, her outfit almost caused an optical system failure. 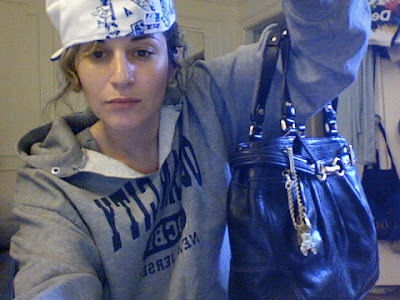 So the question is this: You're going to a fancy party, if you had to make a choice would you rather show up in Designer Schlep (sweats and overall shlubbiness with a designer dud of choice - bag, glasses, jewelry) or Tacky Chic (hot by all accounts, but cheap looking and potentially kinda slutty). Need visuals? The choice is yours. Can't wait to hear it. I usually go too far in the direction of appearing not to care, especially since I can't afford designer anything. But I believe that if you take an aesthetic concept to its logical extreme, you will always succeed. So while I prefer your style, I always love to see those women dressed up so trashy, because they know how to hurt so good. Style can be a kind of folk art, and theirs communicates so well. They are like reggaeton for my eyes. Wow, designer schlep. I just found my new favorite phrase.